If you are a tourist in Malaysia, this is the word to learn. It is pronounce as ma-ma-king. Mamaking is an activity much loved by Malaysians, very similar to how Britons and Australians love going to pubs. Mamak refers to the Indian Muslims (usually from Pakistan and India) migrants who settled or work in Malaysia. They are some of the most hardworking and enterprising group of people. They cook delicious foods and owns most of the Muslim foods restaurants in Malaysia . The drink to order is of course the teh-tarik. It is made of this sinfully sweet condensed milk and only-mamak-knows-what brand of tea because you can’t ever get the same fragrance elsewhere. The concoction is put into a mug and the mamak will ‘pull’ the tea in another mug. Ok, I will get a video of this action next time. Hot foods like rice, roti canai, tandoori and lately, even Western foods are available 24/7, 365 days a year. If you go to a mamak stall, you have to leave all the health advices at home or else you won’t be able to enjoy your trip. Take for example this piece of innocently look roti planta. I bet one can put on 10 lbs in one week if it is eaten daily. They prepare this from a piece of wheat flour dough and the dough is stretch to a big piece. Then, the mamak added in a huge, really HUGE blob of planta (spells TRANSFAT!) to make this deliciously good. My son has it with condensed milk. I tell you, it is sooooo good. If you want something healthier, then a naan is a better choice. Unless you specifically asked for butter or cheese naan (like the above), it is just flour, minus fats. My son loves the naan with cheese. It is like pizza dough with only cheese. 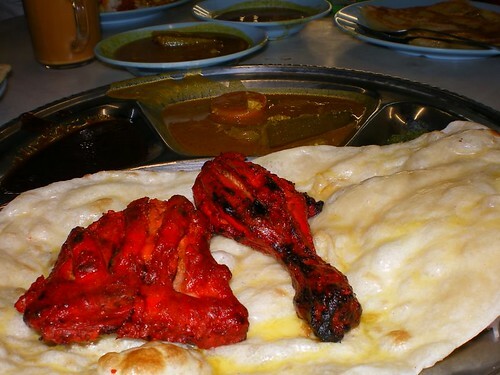 Many mamak restaurants are into making tandoori chicken but not everyone measures up to how tandoori should tastes like. Previously, tandoori chicken used to be very expensive and only served in high class North-Indian (Hindu) restaurants. But nowadays, you can find any ole corner coffeeshop selling tandoori which is more like red coloured grilled chicken. However, this tandoori chicken from Kassim Mustafa in Pulau Tikus, Penang is worth eating. They usually serve the tandoori with a naan. The provide a few types of sauces to accompany the tandoori. I love their mint sauce, sweet & sour tamarind sauce and the very refreshing cucumber, onion and coriander leaves salad. Try wrapping a small piece of chicken with the sauces and salad with the naan. You will be crave it for life. And here’s a shot of two satisfied customers after a night out, mamaking.Ã‚Â My hubby took this photo the other night because he said it will make the scene like Hongkong.Ã‚Â (note the HK restaurant at the back? )Ã‚Â I quite like it because the moving bus make it like a bustling night city scene, isn’t it? So, if you are in Penang, don’t miss out on the mamaking session, on your own or with friends.Ã‚Â The mamaks are all awfully friendly and speaks English.Ã‚Â Except when they are counting money and it gets a little fishy because when their tongues roll, the figures kept going up!Ã‚Â LOL. Where is your favourite mamaking joint? 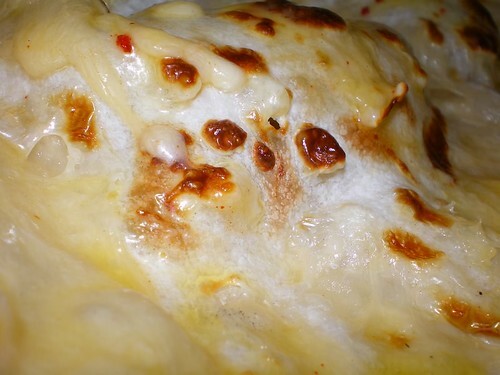 The macro cheese naan is making me drool! I love mamak stall for their teh tarik and choices of roti, especially with the funny names like roti Diana, roti Titanic, roti I Love U, etc. I don’t know if you can find those here (I rarely frequent mamak in Pg), but the one near my Uni in Serdang does. My favourite mamak stall in Pg has to be Kapitan for their Tandoori and many choices of other dishes beside roti. Haha excellent! The next time someone asks me what mamak is, I’ll link to this post. thank god, I thought u didn’t ever eat out. ok ok ! been trying to find the brand in tesco but cudn’t seem to find it! Er….ppl…when u talk about teh tarik doesn’t the word little india rings the bell? I got my huge packet of tea powder from an indian shop where u will see it moments after driving into little india (if u are using beach street)… They taste great but of course u have to get one of those ala kopitiam strainer. Bought the tea a few years ago and it still smells fabulous. Good stuff. Very cheap also considering they import it from India or Ceylon?…forgot liao. 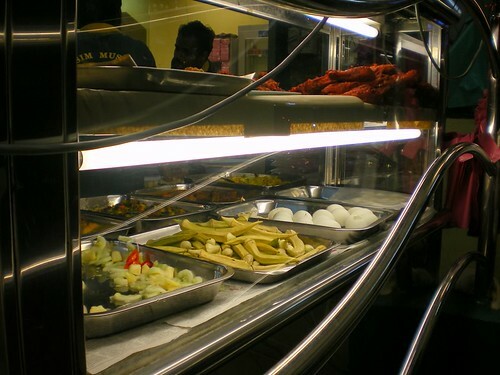 Heh, durianberry and me luv to frequent Kapitan (located moments after coming out of little india using King’s Street. The whole meal is filling enuf to last u hours. I wonder what happen to the street (near Kayu Pg Rd) that has tons of mamak stall previously. Are they still there? Mamak forever! Check out this short film I made about mamak. Enjoy! 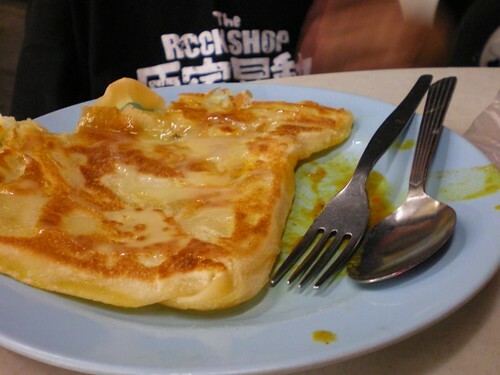 All this good food make me hungry liau lor…….. Mine is Kapitan. Morning, I will go for their tosai. Evening, rice and the naan. My fav is garlic cheese naan. Tandoori and kebab are good too. The workers are friendly too. There is where I normally go. But yeah when he makes his first trip to Malaysia, must definitely mamak-tize him. 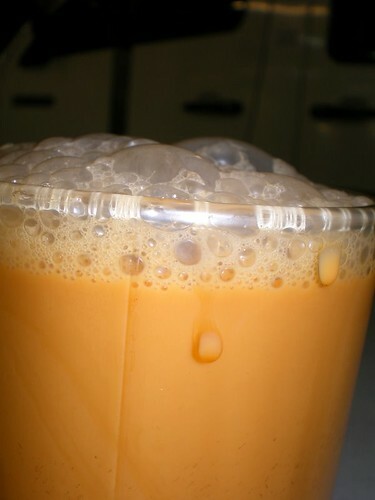 For teh tarik, these mamaks usually mix a different kind of tea not 1 particular brand or type of tea. And some of them even add in a little bit of cinnamon powder. We don’t see them doing this in front of us. Its always premix in a huge jar. I know of a mamak who adds in a little bit of nescafe in every jarfull of his tea premix. another word:: memapley .. mapley = mamak stall .. memapley = go to mamak stall and lepak2+makan there.. Loves the roti naan & tandoori chicken from Kassim Mustafa too. The sauce…hmm besstt!! Some mamak order terms i learned the other day….